Sometimes it is difficult to know how to make school and going to school a more positive experience for your child. Having a positive experience of school is important for children. Important because they are in school for such a large amount of their days. Important because it affects their attitude to their work, the people at the school and the level of enjoyment. Studies find that having a positive school experience decreases absenteeism, decreases suspensions, lessens the desire to participate in substance abuse, and helps prevent bullying. A positive experience of school can also increase a child’s academic achievement, their motivation to learn, and their over all psychological well-being. It should be something you as a parent help to cultivate from home. 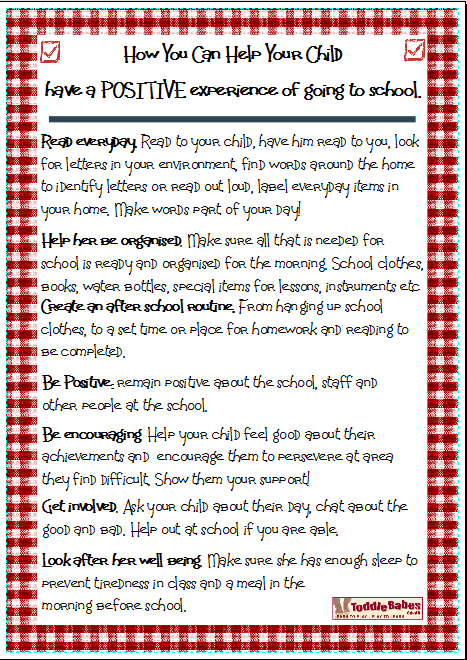 This poster is a little reminder of things you can do at home to help your child develop a positive view of school and the work associated with it. From creating a suitable environment to do school work to making mornings less stressful, take a look at the tips below! As parents, you can help to make your child’s school experience a more positive one. Try to put aside any negative feeling you may have of school and focus on what is good for the sake of your child. Remember, they will be spending a lot of time at school, it’s in their best interests to feel positive about it.